This is the evolution of balance, flowing through the forests of the Pacific Northwest, on a unicycle. Incredible riding. Would you do it? 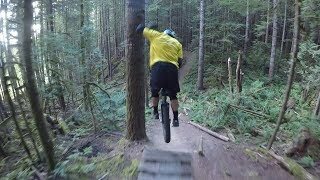 This ride takes us through the icon trails full of wood stunts, and flow. Ryan Kremsater takes mountain unicycling to the limits cleaning the features and going big.